Lisa Angel was one of the ‘in conversation’ panelists of self-made local role models at the first Prowess business bootcamp for women. Lisa started out working in her living room, customising clothes and jewellery with vintage finds. She quickly found an appreciative customer base and the business has grown to employ over 30 people and a turn-over of £2.2 million a year. Lisa is passionate about delivering unique products, providing excellent customer care and going the extra mile for both customers and staff. She shares her experience in this interview with Anne Francis. What led you to start Lisa Angel? After working for years in London for large multi-national fashion companies, I felt that I wanted to provide people with something more special, unique; something that the chains couldn’t provide. That includes exceptional customer care, unique products that fit a personality, personalised service and going the extra mile. I felt unfulfilled creatively and also wanted to combine having a family with my business idea. That led me to come back to Norwich where most of my family lives. I started off from my living room, customising clothes and jewellery with vintage finds. I scoured the charity shops and found many gems. One shop saved all their branded jeans for me and I bought full bin bags for a pound each. A local department shop started selling my customised tee shirts and I was enjoying designing between caring for a baby. In 8 years I now run a business employing 30 people turning over £2.2 million a year. I have two main outlets in a trendy part of Norwich Lanes and a mini-store situated in a large shopping mall. The web trade has gradually built up to represent over 60% of turnover. I have my own website lisaangel.co.uk and my products are also sold on eBay and Notonthehighstreet. What were your main barriers to starting the business? 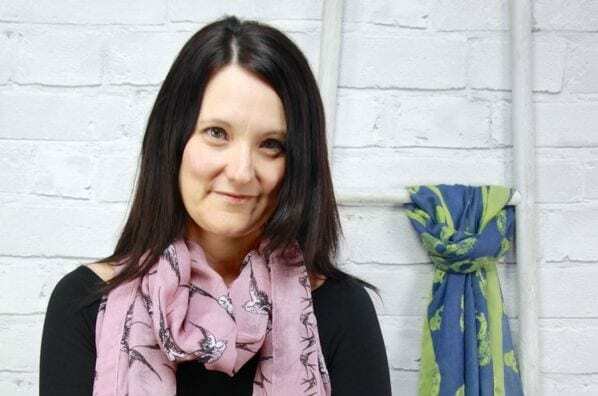 Working capital was a big barrier to starting the business which I overcame by selling my car and taking out a small loan from Norwich’s Women’s Employment Enterprise Training Unit (known as WEETU). WEETU was set up to help women in the East of England to start and develop their businesses. They played a significant part in my being able to afford to start the business. Finding the right equipment was tricky to start with and BizFizz, another local business support scheme, helped out with donated sewing machines, finding a local company to sponsor us to build a website, and even getting us involved in a big fashion show. This was one of my best memories of those years. What other help did you receive? I found being mentored by other business people very helpful at the time. I remember how surprised I was at how much good will and support was available from established local businesses. Finding a bank manager who would listen to my individual banking needs was paramount in starting the business. Eventually I found one who then became the first customer for my line of Lisa Angel customised jeans. He helped me with finding the right sort of account and with advice on marketing and cash flow. I developed my values during a test trading period that involved running a fashion event with other local, creative businesses. It was called Strictly Not High Street and ran for 3 years. During this time I found out a lot about my customers, this being the first time I had sold directly to the public. I found I had a natural ability to link in with other like-minded people. The customer’s experience has always been of paramount importance to me. I want people to leave the shop happier than when they arrived. My shops are full to bursting with beautiful and pretty items, perfect for treating ourselves or for gifts. We love our customers and enjoy a great reputation for customer care. We love to go the extra mile and will do everything we can to ensure a positive experience. We actively seek feedback and will respond quickly to any issues raised. What advice would you give a women starting a business now? Find out what help is available. Talk to people in similar, more established business. If they are successful then they will want to share their experiences with you. If they don’t want to talk then you have lost nothing by asking. I have found that successful business people can be extraordinarily generous with their time, advice and even contacts. I am lucky that my family have always helped me and been tremendously supportive. My talented husband even built our first mini-store by hand and my parents, in-laws and sister have helped in too many ways to list. Push yourself out of your comfort zone, that’s when things start happening – this could be going to networking events etc. making that call or visiting a trade show. Take your time and take as long to test trade as you need – I felt confident after learning so much about my customers over the initial few years and was able to enjoy the process even though it was still very hard work. Talk to your customers and give them plenty of opportunity to feedback. Make use of social media to involve customers in your successes and offers. Get a business coach who understands your dreams and aspirations, with good contacts to help you access available assistance as well as introduce you to other companies etc. It can be quite lonely otherwise and could be easy to take too long or even give up. My future plans are to continue expanding and to increase our market share, to go on finding ways to keep our customers and staff really happy, and to continue to link with some of the most creative people in the fashion world. As my team has got bigger and people have taken on more responsibility my creativity has been able to flourish and I have more time to do the tasks that I love. It is also important to me to give opportunities to our young staff to enable them to grow and develop. I am immensely proud of what we have achieved together and look forward to much more in the future. I am daring to think even bigger, more beautiful, bolder, better and brighter. The Business Bootcamp for Women was delivered by Prowess, sponsored by NatWest and Worldpay. I love your jewellery! It’s great to see that you can successfully start a business and a family around the same time, kudos for jumping in and doing something you love!